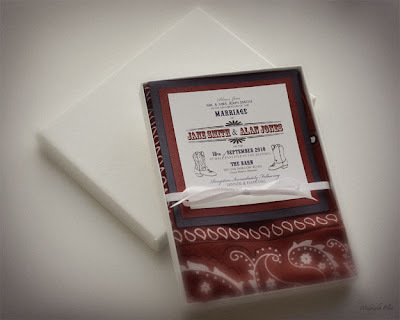 Midnight Blue: Invitation Design - Way Out West! This invitation was designed and hand worked in our studio for a wedding in a barn. The invitation was a fun, square shape, backed with red and blue and used a variety of old time fonts to give it a western poster feel. It arrived in a creamy box, along with the enclosures, nestled on top of a bright red bandana.